1) Perfectly Competitive firm in long run equilibrium in a constant cost industry. c) In the LR firms enter pushing supply back to original price. So, most FRQ's start with the firm in Long-Run Equilibrium and then market demand increasing/decreasing. The College Board asks you to show the effect of the market demand, profits/losses. Easy up to this point, Yes? 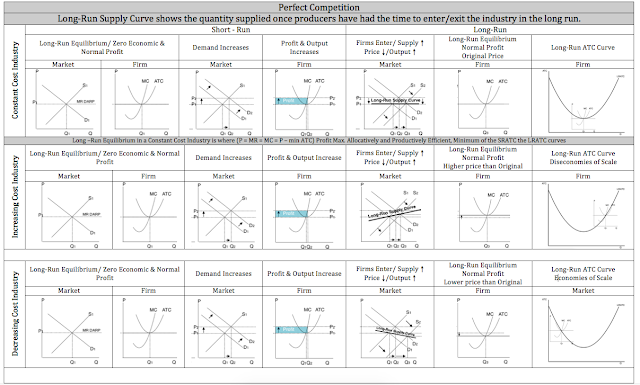 Then they ask you to explain what happens to the long run supply curve and what happens to the price in the market (compared to the original price). Know that the Long Run Supply curve is simply a line drawn between the original equilibrium point and the equilibrium point after all firms have entered/exited the market. It shows the quantity supplied once producers have had time (long run) to enter/exit the industry. Sometimes its easier to see the big picture or the flow of things. In essence the market is in equilibrium, no firms want to enter or exit as the existing firms are all making a normal profit. This implies that no adjustments need to be made. then something happens (Demand increases) Why??? 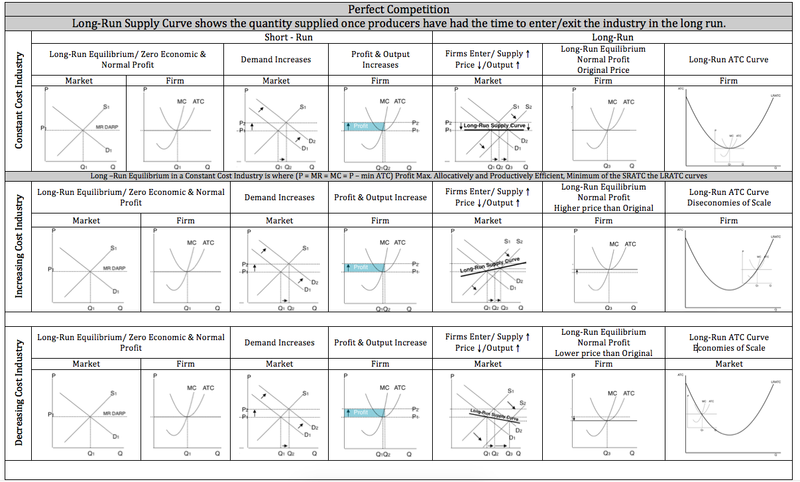 Look back at the Demand Supply Cheat Sheet! These firms adjust in the short-run by hiring more labor. 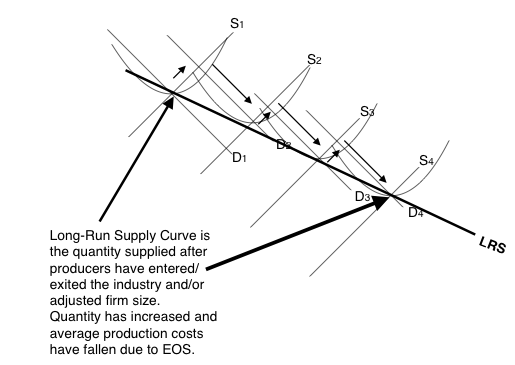 Due to diminishing marginal returns firms might need to buy a larger factory and/or more machinery. In the long-run (remember?) firms can enter/exit but also more capital can be added (factories and machinery) for firms that need to expand. Supply increases but in this instance, supply increases proportionately more than demand had increased. This is due to resource prices used in production decreasing marginally due to economies of scale. How does this look over time. Notice that demand increases but less than the supply curve increases. Prices are falling as firms get larger due to economies of scale. Think agriculture. At the turn of the last century in the US, 80% of the people worked on farms now the percentage is around 2%. Firms got more productive and much larger. Food costs have fallen due to technology and the industry adjusted with different levels of labor/capital mixes. What if we draw in the ATC curves in the short run. Here is the same graph above with the short-run atc curves drawn. Understand that in this decreasing cost industry, as demand increase, supply responds in ways that price falls in the market due to ATCs falling for the firm. 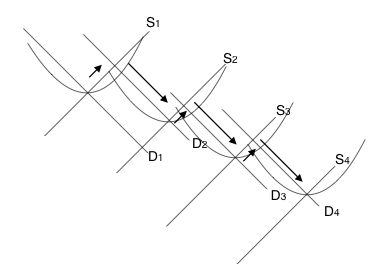 There are connections to this graph. 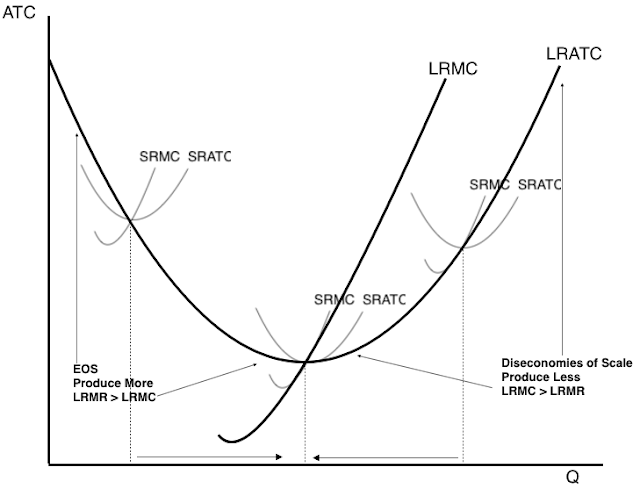 In the above Firm graph,, if we are producing where MR>MC then we should produce more. How? Hire more people... If we are producing where MC>MR then we should produce less. How?? Fire some people. We want to produce where MR=MC = Profit Max. This is the quantity society wants MC=MB from societies standpoint. Right Side, this industry has to many firms or its firms are to large and costs are rising. Firms are to large or there are to many firms. Middle - Constant cost industry, firms enter and exit without price changes. This is approximately the right amount of firms in this industry at this point.